TQ Series CoilOver Shock, 4.1" Travel for 2.5" I.D. Coil. Triple Adjustable. Eye/Eye Mounting. Includes Coil Kit. Sold EACH. Track Quality Series – The newest addition to the RideTech line is the Track Quality ("TQ") shock series. Going beyond the typical double adjustable units that have been popular, the TA shock has a single rebound adjustment and a DUAL stage [high speed and low speed] compression adjustment. It uses a remote reservoir that is connected with a 30" braided line for easy installation in a variety of installation applications. 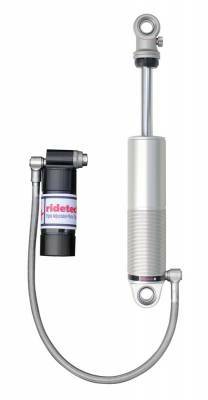 The high speed adjustment allows tuning for impact harshness...pot holes, speedbumps, offroad use and other harsh road irregularities that might induce a high speed excursion of the piston rod. The low speed adjustment allows tuning of ride quality, as well as the general cornering characteristics of typical road course and racetrack use. Typical Applications: The Ridetech TQ is currently the ultimate choice for autocrossing, track days, drag racing, and other extreme environment use.